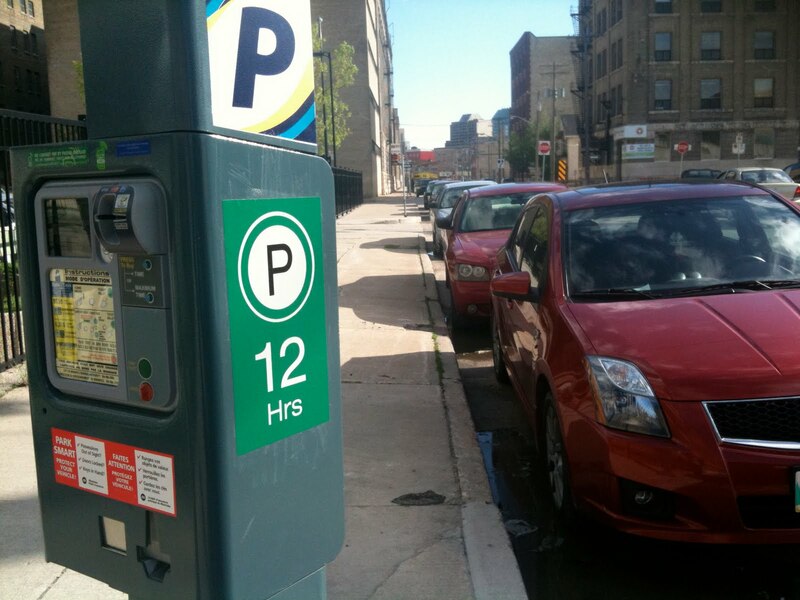 The Winnipeg Parking Authority is bringing its mandate to "improve the local parking environment for all Winnipeggers" to Red River College, and it includes your chance to pay for three-and-a-half more hours of parking a day. Let's party! When I parked my car on Adelaide Street today, I noticed that someone had posted mysterious "12-Hrs" stickers and signs down the street. Pranksters, no doubt! I had no idea what this meant - one of the signs of the Apocalypse, perhaps? - so I visited the Parking Authority, the city's least popular "special operating agency," online. "On Street parking in Winnipeg is generally a 2 hour time limit, although there are some 12 hour meters in lower demand areas on the edges of downtown." I took this to mean that we can now park at meters around the college for periods longer than two hours without moving our cars. Finally: some good news! I wanted to be sure, so I called the Parking Authority, and a helpful woman told me that the two-hour thing was true. But there was a horrible price to be paid for the privilege: you now have to plug the meters between 6 a.m. and 6 p.m. (the "12 hours" on the stickers) instead of the customary 9 a.m. to 5:30 p.m. I didn't believe her, so I tried to plug the meter at 5:30 p.m. and - surprise! - it didn't reject my loonie, as it normally would. Instead, it gobbled up my money and promised me I'd be safe until 6 p.m., at which point the meter readers presumably go home to their families and tell them heartwarming tales about how they've improved the local parking environment for everyone by writing more tickets than ever for people who didn't realize the rules have changed. To do the math: that's an extra three-and-a-half bucks a day, or $17.50 a week per parking spot. Or three fewer beers at the King's Head per person. With friends like the good folks at the Winnipeg Parking Authority, who needs friends? And who they heck manages their website? Yuck. Oh, and thank you for posting this information, otherwise I wouldn't have known about the new rule! Great communications WPA - not. I know there's been a lot of "weird stuff" going on with Winnipeg parking lately - and I saw CBC's report last week. The Saturday parking thing is confusing enough...the city making millions of bucks on the "poor communication" of the parking rules.